Elmer McCurdy wanted to be an outlaw in the worst way….and that’s what he became…an outlaw in the worst way. His criminal career was distinguished by misfortune. His first two robberies were bungled burglaries. He used too much explosives and destroyed the safes and the contents. Then he decided to try his luck at robbing trains. 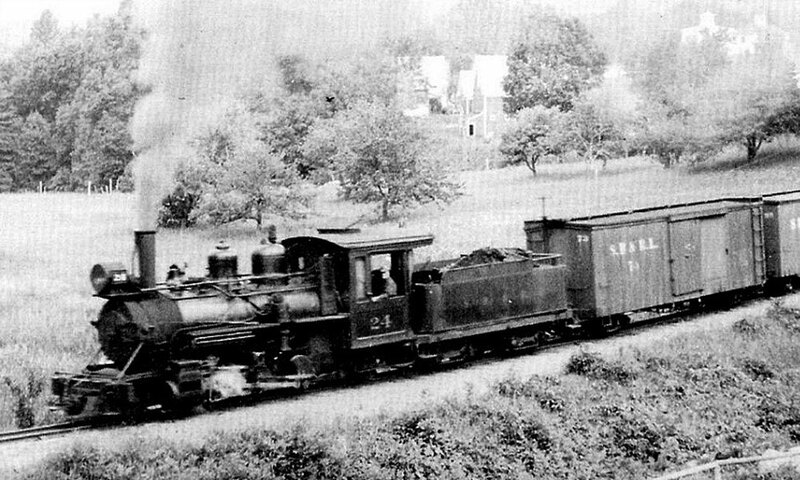 On March 30th, 1911, at Lenapah, Oklahoma, McCurdy and two friends attempted to rob the Iron Mountain Railroad and again he overestimated the amount of nitroglycerin, blowing the express car to splinters, destroying the safe and scattering its contents to the winds. The paper money was destroyed and the coin melted or was fused to the safe. They did manage to pick up some $450 dollars scattered on the ground. On October 4th, 1911, he robbed a Katy train near Okesa. The take on this one was forty-six dollars and two bottles of whiskey. It turned out he got the schedules mixed up and robbed the wrong train. The express train carrying the $400,000 payroll he was seeking rambled by a few minutes later. He tried to hide but bloodhounds tracked him to a ranch where he tried, unsuccessfully to shoot it out. 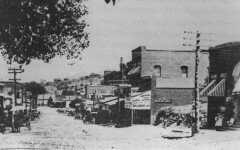 Elmer’s corpse was taken to a funeral home in Pawhuska. The mortician, worried that no relatives would arrive soon to claim the body, embalmed him with an overdose of arsenic. Elmer was propped up for five years in a corner of the funeral home where he became known as “The Embalmed Bandit” before a couple of men showed up claiming to be his brothers. They said their poor mother in San Francisco was dying and wanted to see her son before going on to her “Great Reward.” They convinced the Osage County attorney to let them take Elmer home. But on October 7th, 1916 Elmer was headed not to California but Kansas to join a traveling carnival show. 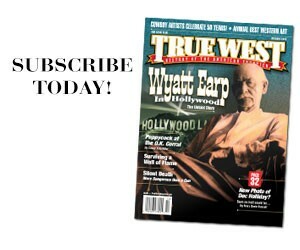 He was about launch one of the longest careers in show business history. 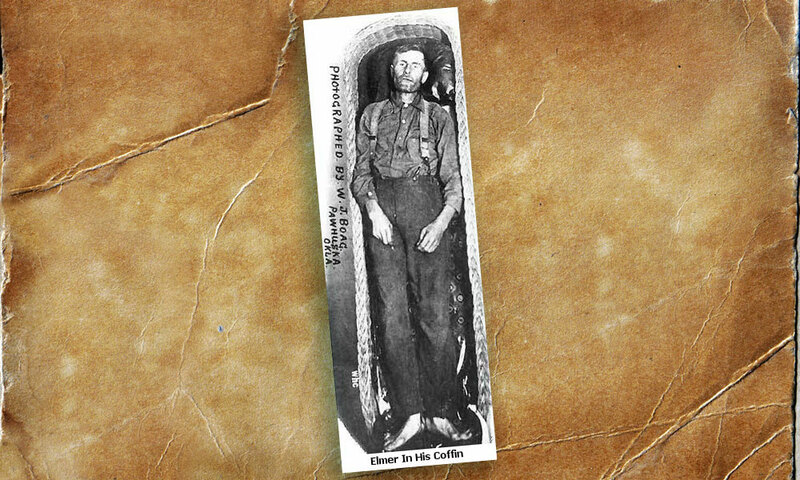 For those who don’t believe in the afterlife…..Meet Elmer McCurdy. Turns out one of the men claiming to be his brother owned a traveling carnival show. Elmer was an immediate hit becoming the show’s headliner. 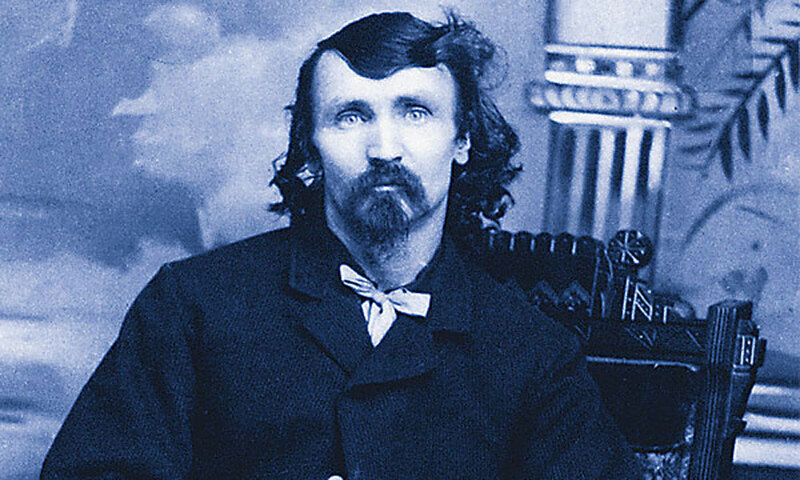 Now, one of the West’s most inept bandits was getting top billing along with wax replicas of Jesse James, Bill Doolin and the Dalton brothers. Through the years Elmer was owned by a number of carnival shows including the famed Hollywood Wax Museum. Whenever he began to decompose more wax was added to patch him up. After a few years his owners took for granted he was just another wax figure. By this time his show biz career had spanned 55 years, some 54 years longer than his criminal career. His last role came in 1971 while appearing in a wax figure exhibition at a museum in Long Beach, California. The museum was being used for an episode of The Six Million Dollar Man. As workmen were lowering him from a makeshift gallows one of Elmer’s arms fell off revealing a piece of human bone. Police were called and Elmer was taken to the Los Angeles Coroner’s office where forensics eventually traced Elmer to Oklahoma. Chief Coroner for Los Angeles County, Dr. Thomas Noguchi, the “Coroner to the Stars” that included Robert Kennedy, Sharon Tate and Marilyn Monroe, he was returned to the state of Oklahoma where, on April 22nd, 1977 he received a grand funeral in the town of Guthrie, complete with a black, horse-drawn hearse and fancy casket. Afterwards he buried next to outlaw Bill Doolin. At long last Elmer was in the company a real outlaw.